Easy three ingredient recipe to make your own homemade whipped cream! Add the 3 ingredients to your stand mixer bowl. Whisk on high for about 1 minute until small peaks begin to form. 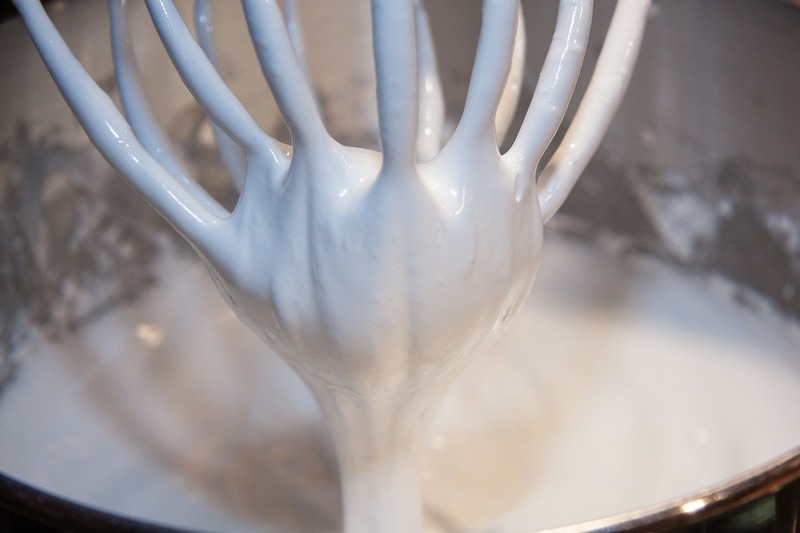 Continue to whisk until stiff peaks form for about 2-3 minutes. Have you ever had homemade whipped cream? It’s by far way superior to what you’ll find pre-made in the supermarket. The best part is? It’s super easy! Made with just 3 ingredients! This recipe makes about 2 cups of whipped cream. Just know that unlike pre-made store bought whipped cream, homemade doesn’t last. You will want to make this before serving and it will last about 2 hours or so. I used the new KitchenAid Artisan Mini to make my whipped cream. It’s the new and innovative addition to the KitchenAid Stand Mixer Family. With the launch of the new Artisan Mini, there is now a smaller mixer that takes up less counterspace, is lighter in weight so you can easily move it around your kitchen and has the same iconic design and power as our other tilt-head stand mixers. The NEW Artisan Mini Stand Mixer is 20% smaller and 25% lighter, making it the ideal culinary tool for smaller spaces and kitchens. The compact size and lighter weight perfectly suit the needs of a city dweller who loves to cook in their smaller spaces. Artisan Mini is made for your lifestyle, made for your kitchen, made for you. Though mini in size, the NEW Mini Stand Mixer can make up to 5 dozen cookies in it’s 3.5 quart stainless steel bowl. The Artisan Mini Stand Mixer also features 10 mixing speeds and comes with a coated flat beater, dough hook and 6-wire whip. The KitchenAid® Artisan® Mini Stand Mixer (KSM3311X) is available at Best Buy and retails for $249.99. Discover the LG OLED TV at Best Buy! My teen has gotten into baking but has a dairy allergy. We are going to hunt down some dairy free heavy cream and give this a go! 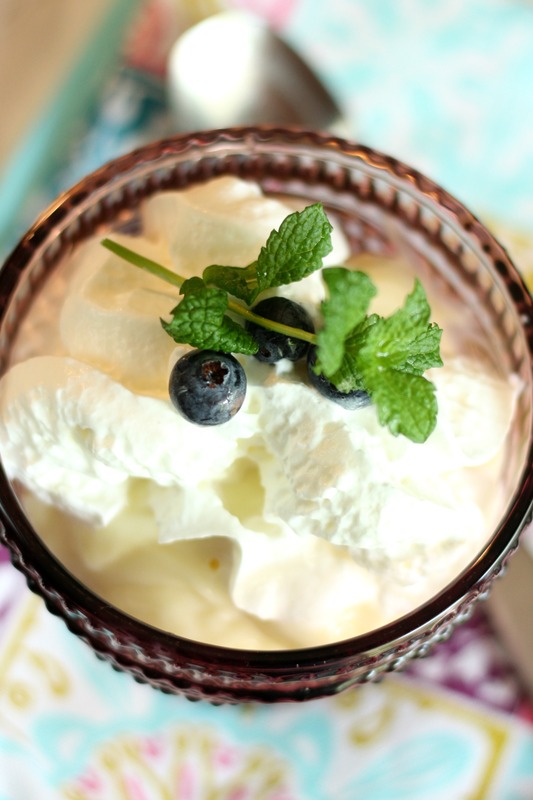 I love homemade whipped cream – mostly in a pavlova! It would have to be my absolute favourite dessert and what I ask for every birthday. I grew up on homemade whipped cream. My dad wouldn’t eat anything out of a container, so he made his own. It is truly the BEST! Oh, that mini mixer looks great! I’m still using a hand held because I didn’t want to give up the counter space, but that looks doable! Wow! First time ever seeing a recipe for whipped cream. This is a great idea. I think I will try it out. Thank you for sharing this! This looks delicious and I love making foods with no preservatives or added “no good for you” ingredients! I am so making this for my fresh strawberries and blueberries! 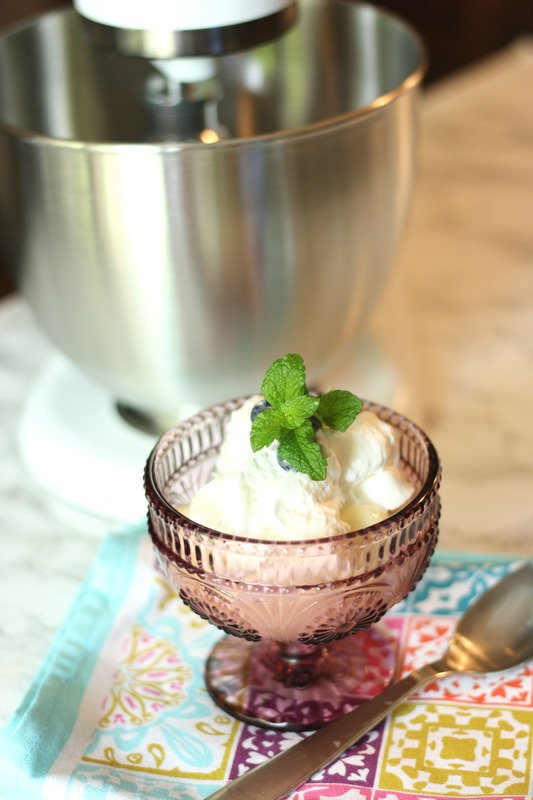 There’s nothing like homemade cream on top of a sundae! I think this is awesome and I love that it takes just 3 ingredients to make one. I should really consider getting that compact mixer! I’ve been hearing so much about this mixer, I think it’s awesome and it’s definitely nice to have at home. Thanks for the homemade whipped cream recipe! That was quick and easy! This looks so good! I love homemade whipped cream! And I love using my mixer for homemade treats too! I love homemade whipped cream!!! It’s so hard to even eat the tub/can stuff when you’ve had the real thing. Right? And it’s pretty simple to make too. Ooo this looks yummy and not as difficult as I thought it would be. I should try this for our next dessert party! Oh my gosh this looks wonderful! I love a good whipped cream, so I will have to try out the recipe!! Our kids would love it too. I love homemade whipped cream! My son loves it so much, he eats it plain! My mom usually makes it, I had no idea it was actually so simple to make. Oh this is going to be perfect for so many desserts! Great recipe! The mini mixer really did the trick! I have never made my own whip cream before, but I love the idea. I’ll definitely have to try it sometime! The only time I’ve made fresh whipped cream was when I worked at Starbucks. As I recall, we really did make it fresh. This is so easy…yummy on strawberries! This sounds so good! I’ll have to make this in the winter with hot chocolate. I have never had homemade whipped cream but now I.think I must! That looks amazing. I only fear that it would never make it out of the bowl as I would eat it all before serving – LOL! I’ve never made my own whip, but it looks pretty easy and I’m interested in trying it! Thanks for the recipe! I’m coveting that Kitchen Aid and the homemade whipped cream!! OH NO! Thank you for letting me know my typo! Just updated. Is the best! So yummy!!! Isn’t the Kitchen Aid great? My husband always uses it and I am going to have to tell him to make this for us! My son and his girlfriend LOVE this mixer! I’m going to have to share this recipe with them because I love whipped cream – especially when it’s homemade! Oh yum. This could be so dangerous. I’ll be making this all the time. 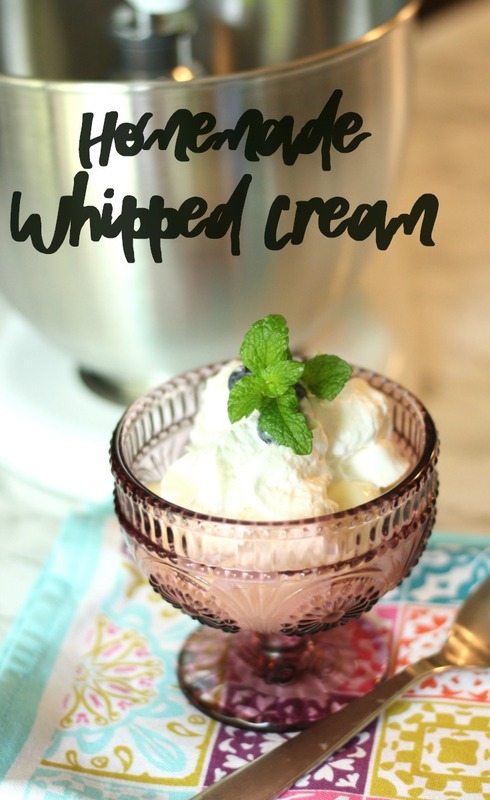 Sounds pretty awesome and I never would think to make my own whipped cream! Homemade whipped cream tastes so much better than store bought. It does take a big more effort, but it’s totally worth it. I love making my own homemade whipped cream! I use it for everything from my iced coffee to yummy desserts! I can’t wait to make up another batch! I can only imagine how amazing this tastes! I want to try this this week. I love whipped cream, but the stuff from the store just makes me feel blah. I pretty much love adding whipped cream to most of my desserts. This Homemade Whipped Cream recipe is awesome and plan to try it out at home. 1) This is so much better than store bought, and 2) this would be such a fun science activity with my eight year old daughter! Homemade whipped cream is so perfect. It’s so easy to make it just requires the right equipment. My grandmother used to make something very similar to this when I was little and I used to get so excited to visit her in the summer time hoping she had made her homemade “ice cream”. This is such a simple recipe to make – I’m not sure why I didn’t discover it sooner! Thanks for sharing! My grandmother always made her own for holidays. Ive never had a recipe, but now I can try this one. It always tastes better than store bought. Thanks for sharing. I don’t have a mixer at all, and I’m wondering if I can make whipped cream with a wisk I’d hate to find out I can’t after buying the cream. I was just telling a relative about the Kitchenaid Mini – she never gets excited about products I tell her about, but this she was so interested! I’d love to have one, too. I bet this will be a big hit! I have seen a lot of recipes using a hand whisk or hand mixer. It sure looks better than anything that comes out of a can or tub from the store. Sounds yummy! Growing up on a far we had whole milk and would skim the cream on every jug. Store bought milk does not afford this little luxury! Yummy! I have actually never made my own whipped cream before, but I am sure that is tastes amazing! I will definitely have to try this sometime. Thanks for sharing!